Claes Otto Jennow’s works invite at every glimpse a reconsideration of our relationship with the visual. His collage and retouching techniques bring new layers to otherwise recognisable images, emphasising notions of authorship, memory, and visual heritage. Claes’ works are interruptions of an established order, born perhaps out of an instinctual sense of disapproval: of the normal, the expected, the mundane. In many of his works, the fusion of cosmic motifs and terrestrial cultural heritage has the capacity to produce a new space – a new world of reinterpreted symbols and reimagined places. Collage as a technique is associated with fragmentation, the manipulation of existing visual elements, with the purpose of recreation – the assembling of a new order of the visual. His artworks reflect fully this approach. They maintain a strong narrative and cinematic character and follow the artist’s interest for mediums that enable storytelling. The artist puts together a number of seemingly incompatible elements, blending time and space and calling attention to the various dualities that mark our history: celestial – terrestrial, creation – extinction, utopia – dystopia. His collages contain snippets of an unmeasurable record of humanity: temples, wonders of the ancient world, objects of religious adoration, technological innovations, sky-scrapers, emblematic cityscapes, and iconic photographs. At first glance, they seem thrown together in random clusters, but they do in fact raise important questions: Why do we build what we build? How do we care for our planet, in the race of progress and innovation? What can we learn from our collective story so far and how can we best use these lessons to articulate sustainable visions for a better future? Tell me a bit about your creative roots and artistic evolution: when did you start making art and what drove you to it? Are you self-taught? I keep hearing this question and I’d be lying if I said I’m not bothered by it. I think people should step back from this concern with the starting point of someone’s career or education, and just look at the work and let it speak for itself. You don’t ask a baker how he started making bread – you just enjoy the bread and trust he knows what he’s doing. Fair enough! But I’m still curious about your background in street art. Is there anything you keep from this, in terms of approach or technique? I have a background in graffiti – I don’t currently use any technique from that, but I guess there’s some tenacity in doing graffiti that I keep today. There’s a lot of image manipulation in your work – what attracts you about this technique? What drives you to modify images? As a child I had a lot of fun drawing beards on everybody’s faces in newspapers and magazines. I went on to using photoshop to do these alterations, but when I started doing collages, I chose to do it analogue, old-school, with scissors for cut-out, and using paint as a smudge tool. Why the manipulation using add-on material? I guess I’m trying to tell my own stories by changing slightly other people’s stories. There’s also this dimension of touching those stories, a direct contact that I find necessary, when interweaving narratives like this. Your work can be read as quite political – is this something you’re after – making a political point? Do you blend the personal and the political? My personal story has a strong impact on my work today, and it’s true that I use political undertones in my work. When I was removed with force from my home at the age of six, my life and state politics became intertwined, beyond my control. I was moved from home into municipal care until I turned 18. That truly took a toll on me: eleven schools in nine school years. I have no restraint to say that I hate the system. After school, I went straight to jail – I didn’t know any better. I never really knew love and sometimes I think I’m a product of hate. Art helps me “look for normality” in my stories and I construct all these narratives so that I myself can understand what happened. When my art doesn’t have a political view, it’s about nature, which I find truly honest. So, you could trace a clear influence of where you grew up in your art? I grew up in a lot of places, but I call Ishøj the place “I’m from.” Vestegnen, Glostrup, Ishøj – they definitely had an impact on me doing graffiti. Collage can be an ambiguous medium – it can generate new worlds, but it somehow requires the breakdown of the existing one. How did you navigate towards collage as a technique? Are you most attracted by the building of new worlds or the tearing down of the old? Interesting question! Building a new world should be for the people who are able to fill it with love – no one else! I’m sure my creativity builds things up, but my human nature wants to tear it all down. 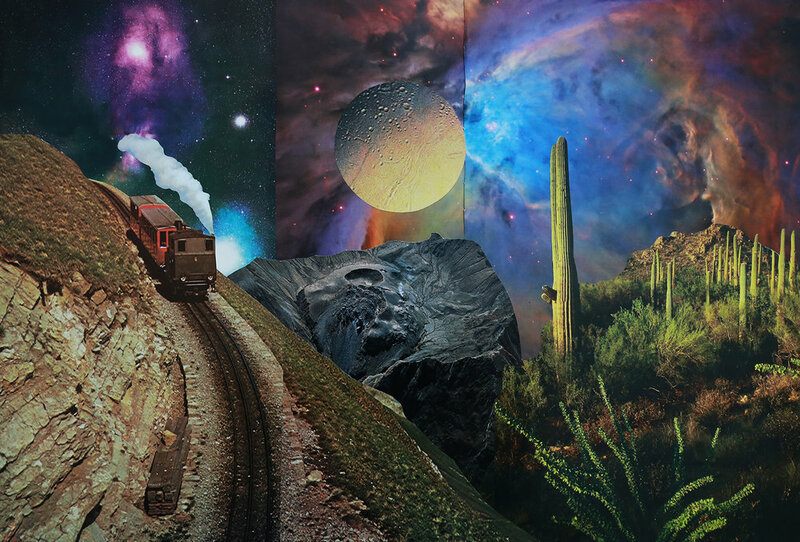 I’m intrigued by the mix of terrestrial and cosmic in your collages – what drives your interest for the cosmic? I believe my mom and dad are in the sky and everywhere around me. I believe that love could find light in an eternal darkness. I believe everyone consists of equal good and evil. I believe there is truth in the mother and the child, the organic and the mineral world. Cosmos is all that and much more, and we certainly haven’t seen all of it yet. I’m curious about the use of images of built environment and cultural heritage – all sort of thrown against each other in clusters of history, memory, maybe visions for the future. How do you conceptually integrate architecture and urban space in your pieces? Architecture and pieces of built heritage are in my works because of my interest in history. I love the mix of architecture that sort of grows in time, with styles and aesthetics overlapping at different stages in history. While some buildings are straight up ugly in certain times, architecture from other eras will lift that up. I also redesign a lot on those buildings, cutting parts off and twisting the balance point, and so on. Urban spaces for me become scenes where I display people, or they display themselves. Can you elaborate on the artwork selection for this year’s Odense Architecture Festival? What statement do you expect the exhibition to make in the larger context of the festival? To be honest, I’ll keep my optimism in check! People will probably remember listening to the mayor give a speech and nothing more. Those who know my story will love the works we’re showing; the rest will look at it, and believe it was made on a computer and forget it on the way out. Do you make art for the optimistic or the pessimistic? I make art for a bigger picture, maybe beyond optimistic vs. pessimistic. You really need to get personal and get to the lowest of the low, for my works to reach as high as possible. I believe one has to be slightly pessimistic in order to be optimistic and vice versa. Claes Otto Jennow lives and works in Odense. Over the years, he has had numerous exhibitions both in Denmark and abroad. In 2015 he contributed to Den Sorte Skole album ‘Indians & Cowboys’ with a selection of collage artworks that were later introduced in the permanent collection of the Danish Museum of Art and Design. The exhibition “Futuristic Depository” is open at Det Fynske Kunstakademi, Odense, until April 14th. Elena Stanciu (b. 1989) has an MA in American Studies from SDU, and currently works as Features Editor for arts and culture publication PETRIe. She is interested in visual culture and contemporary art, design and architecture, gender and embodiment, social justice, and sustainability. Elena has contributed to idoart.dk since 2019.